Blogging is hard work. It isn’t for everybody. And you probably won’t make much money for one to three years. If that doesn’t scare you away, then you probably have the right stuff to be a successful blogger! On the other hand, there are plenty of other ways to bring in money as a stay at home Mom. I personally have tried transcription work, selling Avon, reselling on Ebay, and other full time work from home jobs. I was able to bring in money with all of those methods. But for me, all of those ideas lacked the creative outlet I craved. Only through blogging have I been able to stretch my brain, motivate myself to get out of a ton of debt, an connect with friends I wouldn’t have otherwise met. What are you great at? Think about the things that friends and family are most likely ask your help with. Maybe you’re a great cook, you give the best advice about parenting, or you are the one sure to make them laugh on a bad day. Whatever that area of strength is for you, that’s a great place to start when considering topics for your blog. A word to the wise… prepare to be flexible. I began Medium Sized Family with the idea of writing for medium sized families. You know, people with more than 2.3 kids, yet not enough kids for their own reality show. Well, that was a fun idea. But as it turns out, my readers were more interested in learning how I keep expenses down while raising my medium sized family. And that was fine by me. I’ve always been super interested in the frugal lifestyle (after all, I live it daily!) and personal finance. So I went with the flow. These days, my blog still focuses on several parts of raising a family. But my biggest focus is ways to save money. What’s in a name? Well, in the case of your blog, it’s a lot. You might be tempted to choose a very cute name for your blog. Sometimes that’s a good idea, but don’t leave your reader confused about the purpose of your blog. You’ll want to choose a name that describes exactly what your readers will get when they visit your website. Picking a name that gets a lot of Google searches is also a great idea. Sign up for Adwords and type in some ideas to get an idea of how often your title is searched for. Don’t freeze on this step! Your name should be great….but it doesn’t have to be perfect. Choose something and move on. Do a search to see if the title you want is available. Purchasing your domain name will cost around $10 per year, depending on where you buy it from and if you can find a sale. Always be sure to check for coupon codes before you buy! But do not make that purchase until you’ve decided on the next step, which is…. This step is kind of a big deal. You need to decide how much money you want to put into your blog from the start. How Do You Set Up A Blog for Free? You might be thinking about creating what is called a “hosted” blog. That means you don’t pay for hosting. These types of blogs cost little to nothing to begin. Some popular free “hosted” blog platforms out there include WordPress.com or Blogger. But there are many other options. Be sure to do your homework to choose the platform that works best for you. Why Would I Pay For A Blog? Although I love to save money, I decided that I wanted a self-hosted blog from the beginning. I had done a lot of research on how to blog. I knew that I wanted my blog to earn money for my family and become a business that would eventually help to make thousands of Moms’ lives easier. And from that research, I realized that my dream was best built on a self-hosted blog. If you go with the free (hosted) service, you can be limited by the rules they put in place for you. Companies and brands may be unwilling to work with you for services, ads, or blog posts due to your hosting. If you later choose to move to a self-hosted platform, the crossover can become very messy and expensive. Earning money from a blog takes a lot of time and effort. For me, the psychological effect of having paid real money for my blog keeps me going. I refuse to quit and lose the money I paid! If you decide to go with self-hosting, it will cost you some money. But whether you spend your money on education, an office building, inventory, or in this case, a place to park your internet space, you usually have to spend some money in order to make money. When you choose self-hosting, you also need a platform. This is the space where you work on your blog. You’ll type up posts and determine the look of the blog in your platform. Like most people, I chose to use WordPress.org. (Remember, WordPress.com is the free choice for hosting. Wordpress.org requires you to purchase hosting, but it doesn’t cost additional money to use WordPress.org.) It’s easy to learn to use and is readily accepted by most companies that you’ll want to do business with. Behind the scenes of the blog. This is a blogger’s view from WordPress. I have been with two hosting companies so far. When I first began my blog, I started with a company called Bluehost. After a while, I made the switch to Siteground. I’ve had fantastic service with Siteground, and their prices are comparable to other hosting services. Their start up service will run you just $3.95 per month! That’s a small gamble to take on a business that could pay off big time. Switching to Siteground was a smart move for my blog, because site speed is a priority to them. In fact, site speed is a priority to everyone! Most readers won’t stick around if your host is slowing down your blog. And Google knows that…so they’re less likely to show your blog to searchers. So year, speed is a big deal! Get started with Siteground by clicking here. Once you connect your WordPress to your hosting company, you’re ready to dig into the work of blogging. Most of the work will be done at WordPress. This is where you’ll choose a theme, mess with the design or overall look of your blog, and write those great post ideas you’ve been thinking about. A lot of behind the scenes work goes into blogging. But don’t be discouraged. Take it one step at a time, and teach yourself what you don’t know. Google and Pinterest are your new best friends! One of the first blogs I ever read was Money Saving Mom. She’s been making money from blogging about saving money for a long time, and her advice is always genuine and helpful. Check out this free webinar with more info on starting up your own blog. 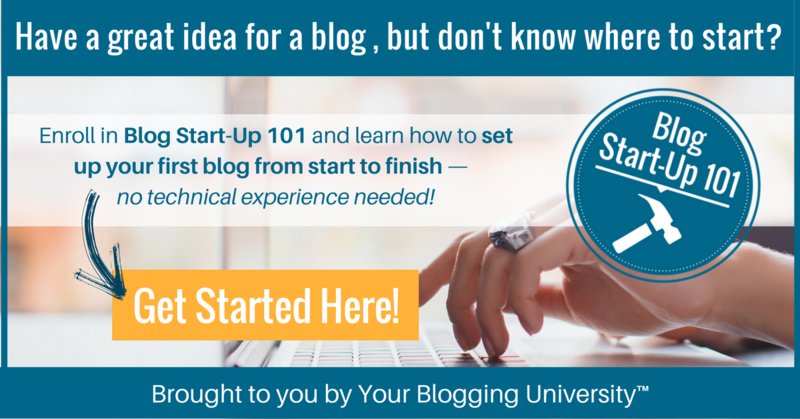 If you like that, you can also try her course, Blog Start Up 101 for a better start to your blog. There are many things to learn about blogging. It really is a lot of work. But if you stick with it, there are great rewards! I’ve met so many awesome people since beginning blogging. And it feels amazing to create something brand new from your hard work. Next up, learn how to get paid for blogging. If you love money saving tips, be sure to sign up for the newsletter! Subscribers get access to free charts and tools that will help your budget. Plus you’ll get extra money saving ideas emailed to you weekly. Have you ever considered creating a blog? What would you like to blog about? How do I create a blog? Most moms are looking for ideas for making money from home. Creating a blog isn't as hard as you think. Find out if you have what it takes to make a successful blog. Great! I had hoped to include it all in one post, but this post was already so long that I decided it was best to break it up. Niches are hard (also, so is figuring out if that would be the proper way of saying that word, ha!). I like the idea, and I’m quite fond of some blogs that talk about one thing, or have the majority of the stuff being one thing. I’m not quite able to do that myself, though. It’s, erm, well…I can’t personally stick to doing just one thing for long in the first place, let alone writing about only that one thing. The fluttering about is something I have tried to work on, but I can’t get a handle on it. Because, uh, yay growing up xD Or something like that? I dunno xD I’m looking forward to the next post, though, because I could use any help in that area I could get! Thanks so much! We have been extremely busy in our personal life, and my blog work picked up quite a bit, too. I’m sad that I just haven’t had the time to dedicate to WayWow lately. It’s such a great community of bloggers! I’ve been blogging for about two months and I’m refining/narrowing my niche to be showing appreciation for first responders and the military.. I’m way excited! I have a question for you. What’s a parked domain.. and a subdomain? I see it says those are included with Bluehost. I have BH but I never noticed those before! The way I understand it is that a parked domain is one that you own, but aren’t currently using. For instance, if you were writing a book, you might want to buy a domain name using the title of your book. But if you haven’t finished the book yet, you wouldn’t necessarily need a website associated with that domain name just yet. You’re kind of just sitting on the name so no one else buys it in the meantime. A subdomain is like a specific area of your website or blog. So if you notice that your blog has two different niches and you want to separate them, you might break them into (for instance) frugal.mediumsizedfamily.com and parenting.mediumsizedfamily.com. I think it is great people can make money blogging. I set mine up as more of a creative outlet and for sharing farm experiences. Thanks for sharing your post at Our Simple Homestead. I think that’s a great reason to blog, too! I really enjoy writing on my blog, too. Thanks for visiting! I do think that you sometimes overthink things. If you spend too much time researching, you’ll never get the courage to actually do it! It’s kind of like having kids. You could research how to raise them for years, but in the end the only way to really figure it out is to just do it. I totally agree. Every day you spend thinking about it – is another day you are not posting or creating your website. Sometimes it is better to do something than to wait until you can do the perfect thing. I got so overwhelmed initially with how to set up my blog. I wound up finding some guy on Fiverr who did the whole thing for $5. Since he knew what he was doing, it probably took him like 5 minutes, but it was worth every penny to me. What a great idea! While I like to know how everything works so I don’t have to rely on someone else to fix it, sometimes it just makes sense to let someone else do the things that are not our specialty. And we can spend more time actually posting and being engaged with our community. I’m definitely looking forward to the next installment, Jamie! Thanks for joining us again at #FridayFrivolity! I think blogging is a great way to make some extra money doing something you love and are passionate about. Stopping by from Share the Wealth, I hope you’ll join us at Small Victories Sunday Linkup too if you haven’t already! I think I’m enjoying blogging more than most of the other ways I’ve earned money since becoming a stay at home Mom! I meant to link up with you, but I’m not sure I made it that far before I got pulled away. Thanks for the reminder! My blog is slowly starting to make money. It is definitely a lot of work, but I enjoy it. Wow. I have had a blog for 5 years and still learned some new things. How much money can you earn from blogging at home? It really depends on so many different factors! There are many bloggers out there making several thousand dollars per month. I know a few bloggers who’s husbands quit work because blogging was more successful than their full time jobs. But that requires months or years of work and dedication. As usual, you get out of it what you put into it.